What do you get that special someone who’s a fan of public transportation (or St. Louis in general)? Look no further than the MetroStore and its holiday party on Friday, December 11. 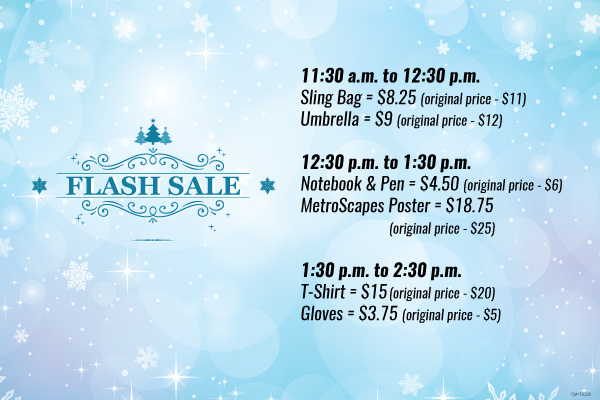 The MetroStore is introducing new merchandise, including: three new Metro T-shirts, Metro journals and pens, umbrellas, ponchos, sling bags, gloves and MetroScapes posters. What’s even better, several of the new items will be marked down 25 percent during a flash sale on Friday between 11:30 a.m. and 2:30 p.m. In addition to getting the best deals, the MetroStore will also celebrate the holiday season with music, free hot chocolate and desserts, and other great deals. Guests will also receive a complimentary gift bag. The MetroStore, located at 701 Convention Plaza in downtown St. Louis, inside the America’s Center, is open weekdays from 8:30 a.m. to 5 p.m. Stop in today or order your Metro Passes online or over the phone by calling 314-982-1495 using a credit or debit card and your passes will be mailed to you.